Sophomore guard Pre Stanley stares down her defender before running a play against Arkansas State on Jan. 24. 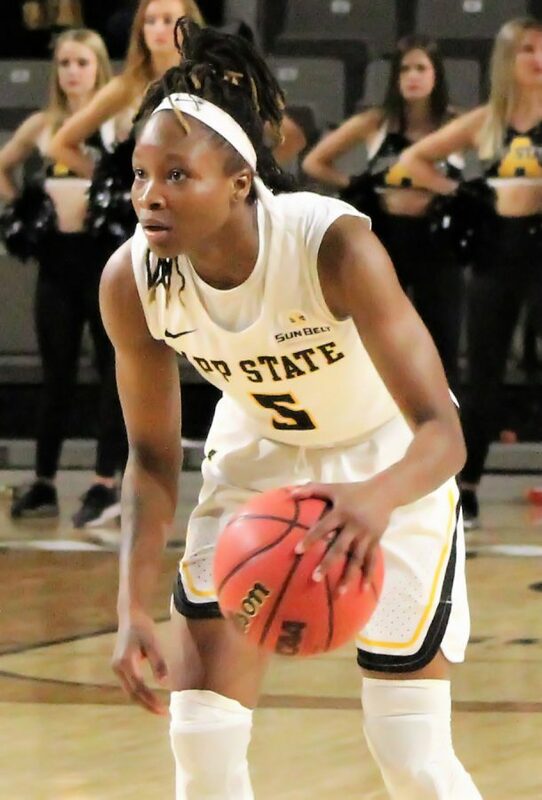 Coming off of a 21-point victory over Texas State Feb. 7, the App State women’s basketball team came up short against UT Arlington, losing 72-65 in the team’s “Pack Holmes Pink” Play4Kay game on Feb. 9. “I thought our kids continued to play hard throughout the entire game. We just could not get over the hump and ever take the lead,” head coach Angel Elderkin said. In their first matchup, the Mountaineers took the Mavericks to double overtime where they lost in a game with 18 lead changes. This time, UT Arlington took an early lead and never looked back. Despite never securing a lead, App State kept the game competitive throughout. 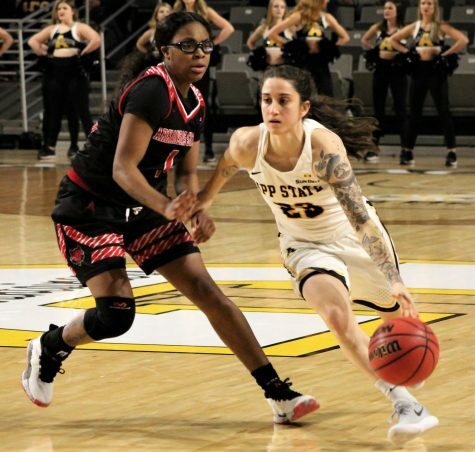 The Mountaineers were only down two points going into the fourth quarter after redshirt senior guard Madi Story hit a buzzer beater to end the third. Story ended the game with a team-high 18 points. Plummer also made her presence felt racking up her third straight double-double with 14 points and 17 rebounds. UT Arlington is ranked second in the Sun Belt Conference, but after losing in two close games to them, the Mountaineers are eager and prepared to potentially face them a third time in the conference tournament. “We can definitely play with them and we can definitely beat them. It was a pretty close game throughout and we still didn’t play our best so I think that’s really important whenever we see them again in the Sun Belt tournament,” Story said. The Mountaineers have a week off to refine their game before they start a three-game conference road stretch against Coastal Carolina, Georgia State and Georgia Southern. “This week our focus was on one-on-one defense, and there were a lot of situations today where it came down to guarding your man and we didn’t do it and we know that’s a weakness of our team right now that we have to continue to get better and that’s going to be something that we work on,” Elderkin said. App State looks to bounce back in its next game versus Coastal Carolina, who the team beat earlier this season by double digits. They will square off on Feb. 16 at 2 p.m. in HTC Center.